This amazingly spacious house has been totally renovated providing three/four bedrooms, large . . . This versatile property would be ideal for two families or as a main residence with rental . . .
Beautiful stone house with pool and outbuildings on a 1500m² landscaped park. 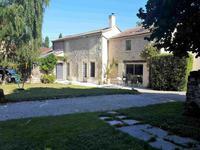 Located 5km from La Crèche with all amenities and just 15km from Niort, this house comprises . . .
Rare opportunity to acquire a beautiful, cared for, traditional Charantaise family home, . . .